I am rewiring my '28 and need a question answered. Sometimes I get confused by wiring. Got it all done. Except I have a question about how and where to attach the wire from the ignition switch on to the distributer. Does it attach to the same screw used to connect the coil into the distributer? From ign switch it goes straight to the coil then out of the coil to distributor. Well this is how mine is wired but not to sure about the ignition-coil-lock setup. i would believe the coil wire would go striaght to the distributor. There is a good little diagram in the owners manual. Can you show us which wire you're talking about? For the 1929 Plymouth, One side comes from your Amp meter and the other to the distributor. see diagram. Consider the points a switch that turns the coil on/off. This on/off action creates the spike that fires the spark plugs. I'm talking about wire #33. My '28 has a single terminal coil so this part of the picture is slightly different from your the '29 wiring diagram. 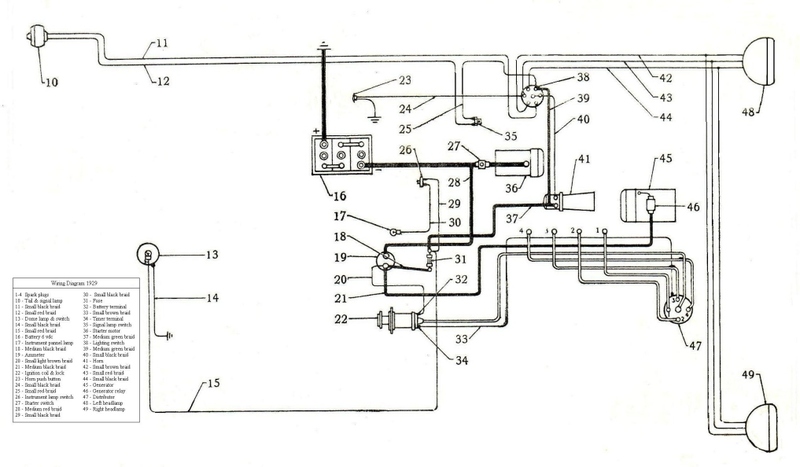 #33 goes directly from the ignition switch to the same terminal, on the distributer, as the condenser. There is a small piece of rubber on the screw to insolate the condenser and ignition wires from the distributer body. Do you have a separate ignition switch and coil. On the 29 they are a one in the same unit. I would assume the 28 is similar but I have not seen a 28 ignition setup. I believe '28,'29 and 30' all have the coil and switch integral in the dash. I used to sell a square printed plate to replace the ignition switch paper sticker,"on,off,ignition",which always went 'south' and I remember it fit all 3 years. ('31 PA was the first to have the coil sticking out 1/2 way through the firewall into the engine compartment.) As you said Chet the points are simply a switch that switches the coil current on and off. The moving point is always connected to the terminal on the side of the distributor and the condenser/capacitor's pigtail/flying lead goes there as well. Then the 'bottom' of the coil winding goes there as well and that wire then goes back into the cockpit and on to the coil assembly under the dash. There has to be one more wire to connect the coil to current. It's usually 'hot wired' to the one fuse in the car not very far away from the coil. And of course you have the high tension lead coming out from under the dash and going through the firewal and connecting to the distributor's top. The Kettering system,as it was called, is always connected this way. Stationary point to ground, moving point to distributor side connector,condenser on the moving point connector,one side of the coil to this connector,other terminal on coil to battery current,sometimes through a switch,sometimes not. The trick with this system was it could not be switched on without a key or hot wired. To steal the car you would have to bring your own coil. I often wonder if this deterred thefts with these cars. I think I got now. I will run a wire from the ignition switch to the single terminal on the back of the coil and then, of course, the coil wire to the center of the distributer. I'm finding out it is a lot easier to do it then putting it into words! I think this should work. If you don't hear from me.................... it blew up! Just one last kick at it. I found this basic diagram on the net. This is the Kettering system used on all vehicles for 60 or more years. At least until the capacitive discharge very high voltage transistorized systems we now have that started in the 70s. The Kettering system I swear is a copy of Marconi's spark discharge transmitter used in his wireless telegraphy system of the early 1900s which predated modern radio. If you replace the points with a telegrapher's key, you have his transmitter. This why you can 'hear' your ignition firing in your car's radio,even a nearby radio, if the system isn't properly shielded. The coil is the 'inductor' and the condenser is the 'capacitor' of the 'tank circuit' in the antenna circuit of Marconi's transmitter that set the frequency of the wavelength. If you were to hook up a branch of the high voltage lead coming from the top of your coil to an antenna, you would have Marconi's spark transmitter and obliterate your neighbors tv and radio reception. All our cars and trucks regardless of make or model use this diagram in some form. If you've ever seen that ignition waveform that mechanics looked at on a Sun Analyzer, the frequency of it was set by the inductance and the capacitance of the coil and condenser. Same as Marconi's transmitter. So I've often wondered if Charles Kettering of DELCO copied Marconi's transmitter circuit but did not give Marconi any credit??? Just an old man rambling. My coil has only one screw on the back of the coil. So the wiring will be little different, as stated on my last post. Do you tend to agree? Your coil has to have another connection point somewhere probably from the key switch assembly if they are one and the same. A picture of the coil assy. would help. It is true that technology assists invention. The spark coil goes back to experiments by Tesla in the 1800’s. The spark at the plug point is created by the collapsing field when the coil is opened. Voltage is defined as = Change in Magnetic flux / Change in time. Voltage in the collapsing field = Delta fe/t when the switch is opened voltage is driven to infinity because you are dividing by t = zero. This gives you the momentary spike near 10,000 volts with minimum current that you see at the plug. I can go on for hours about radio. BTW… the coil actually has two windings which aids the step-up of the output voltage spike. I think this is what Kettering added or used to perfection. I guess to be really accurate you need to go back to the early 1830’s and Michael Faraday and Joseph Henry. Both are attributed with the laws of induction. I personally always equated the distributor coil to Tesla but Tesla's device maintained the transient in resonance. Just goes to show that things build on other discoveries. Without these guys Marconi would be making pizza. Sorry for the regression, I landed my first job as a field engineer explaining induction about 40+ years ago to a hiring panel. Just had to chime in. Chet & Old Man and all of you for all the good input. Sometimes I dislike computers, but where else could I find all this info. for my old Q! My coil has one terminal in the back that connects to the ignition switch. The other end is the high tension (spark) wire that goes to the center of the distributor. Too beat tonight to take a pic. If you want a pic I'll send one, but there is only one connection on the back. I'll hook it all up as soon as work stops interrupting me. Making a living has a tendency of doing that! Whine, wine. I think it will work. I'll let you know if it works or blows up. ps- thank for sharing all the knowledge, although some of it was above my old wore out head! Well I hooked it all up and the fuse blew. I hate to be a PITA, but my car has a separate ignition and coil. The coil has only one screw on the back and a high tension wire on the front. I have wired the car exactly like the diagrams posted, except for the ignition part. 1. A hot from the amp. meter to one side of ignition switch. 2. A hot from the other side of the ign. switch to the one terminal of the coil. Then the high tension to the distributer. 3. A hot from the ign. to the generator relay. The advice and diagrams were great, but the single wire coil and separate ignition switch are throwing me for a loop! Can someone can give me a step by step instruction or specific drawing of this part of the wiring? If you review the diagram that the Old Man provided it is not beyond the realm of possibility that power could be applied somehow or somewhere to the casing of the coil. Clutching at straws here.., that is why a picture of what you have is so very important. If you have trouble posting the picture email it.